At CeBIT this week, Berlin-based VoIP company Snom will be showing off its most secure VoIP telephone to date; the Snom 370. It has new and improved speech quality and handling, a large display and expanded memory . The new Snom 370 with its large high-definition display offers an improved presentation of information like call lists and address books. The configuration through XML considerably simplifies data processing for users and administrators, while an improved mini browser allows access to central as well as public phone directories, and displays news tickers and other information. "Expanded memory offers more room for individual applications and makes it possible to play music and media files," said a Snom spokesperson. "Thanks to its security features SRTP and TLS, the Snom 370 is ideally suited for professional use in security-sensitive surroundings. 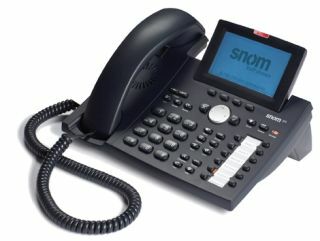 Another distinguishing feature of the Snom 370 is its excellent speech quality."